In a world of endless tech gadgets that promise to “connect” us in ever more efficient ways, people today are paradoxically feeling more isolated than ever. In the midst of plenty we feel disconnected from family, friends, and coworkers. We are, in short, lonely in a crowd. Kory Floyd, professor of family and interpersonal communication at Arizona State University, proposes a solution in The Loneliness Cure: Six Strategies for Finding Real Connections in Your Life. The opposite of loneliness isn’t mass popularity or the accumulation of a thousand Facebook friends and Twitter followers. Rather, the antidote for loneliness lies in the quality of one’s relationships, not their quantity. After all, how meaningful is the note you send to a contact in response to a birthday alert or a job update from LinkedIn? As Susan Cain described in Quiet, some of us are natural introverts, even loners, who need time to ourselves in order to function at our best. We like to work independently. A solitary walk or a night alone with a good book restores us and makes us ready to reenter the social fray. The lonely, by contrast, hunger for intimacy in their personal and social relationships. They are acutely aware of the difference between the amount of attention they get and the amount they want. The lonely feel outcast, isolated, and sad in their unrequited wish to be part of others’ lives. This wouldn’t be so sad if it didn’t imply that nobody cared for them. Because they fear failure in forming relationships, an attitude supported by past experience, they expect people to hold a negative view of them. The discrepancy between what they desire and what they expect further complicates their situation. Physical effects ensue: lonely people sleep poorly, suffer depression and anxiety, have reduced immune and cardiovascular capacity, and show signs of early cognitive decline that worsen over time. As a whole, those most deprived of affection tend to be male, live on the coast, and make more money. Loneliness, then, is a state of pervasive want. Solitude, by contrast, has. For natural introverts, spending time with yourself concentrates the mind. It is a catalyst for creativity. It gives perspective—and perspective is what Kory Floyd prescribes for the lonely. Invite instead of demand. Model the behaviors you desire from others. Be patient and reinforce success. Recognize diversity in displays of affection. Nurture a variety of relationships. Beware of manipulation and toxic affection. Be optimistic but realistic. Floyd points out that all relationships have periodic tensions, and he outlines common mistakes that people make when they try to correct the situation. People spend so many waking hours yakking on their cellphones. We touch our cellphones 150 times a day, far more than we touch one another, and tech interactions certainly lack nurturing and emotional depth. But Floyd argues that technology isn’t the problem—we are. Perhaps using some of that time to converse with ourselves would be more rewarding. We might discover who we are and what is keeping us isolated. 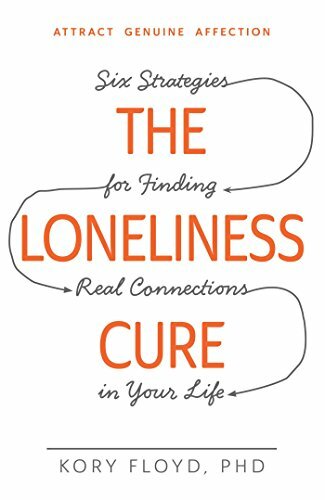 The Loneliness Cure is a resource for those looking to slow down, silence their smartphones, and start making—or reclaiming—meaningful connections in their lives.